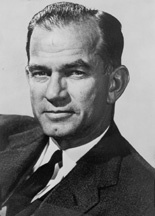 James William Fulbright (9 April 1905 – 9 February 1995) was a well-known member of the United States Senate representing Arkansas. Fulbright was a Southern Democrat and a staunch multilateralist. He supported racial segregation, supported the creation of the United Nations and opposed the House Un-American Activities Committee. He is also remembered for his efforts to establish an international exchange program, which thereafter bore his name, the Fulbright Fellowship. What a curious picture it is to find man, homo sapiens, of divine origin, we are told, seriously considering going underground to escape the consequences of his own folly. With a little wisdom and foresight, surely it is not yet necessary to forsake life in the fresh air and in the warmth of the sunlight. What a paradox if our own cleverness in science should force us to live underground with the moles. The legislator is an indispensable guardian of our freedom. It is true that great executives have played a powerful role in the development of civilization, but such leaders appear sporadically, by chance. They do not always appear when they are most needed. The great executives have given inspiration and push to the advancement of human society, but it is the legislator who has given stability and continuity to that slow and painful progress. It is amazing how soon one becomes accustomed to the sound of one's voice, when forced to repeat a speech five or six times a day. As election day approaches, the size of the crowds grows; they are more responsive and more interested; and one derives a certain exhilaration from that which, only a few weeks before, was intensely painful. This is one possible explanation of unlimited debate in the Senate. Remarks in the Senate, February 2, 1954, Congressional Record, vol. 100, p. 1106. The junior Senator from Wisconsin, by his reckless charges, has so preyed upon the fears and hatred of uninformed and credulous people that he has started a prairie fire, which neither he nor anyone else may be able to control. It is not our affluence, or our plumbing, or our clogged freeways that grip the imagination of others. Rather, it is the values upon which our system is built. These values imply our adherence not only to liberty and individual freedom, but also to international peace, law and order, and constructive social purpose. When we depart from these values, we do so at our peril. Remarks in the Senate, June 29, 1961, Congressional Record, vol. 107, p. 11703. To me, the irony of this involvement with size, as I observed earlier, is the unwillingness or inability of so many Americans to identify themselves with something as vast as the United States. Bigger cars, bigger parking lots, bigger corporate structures, bigger farms, bigger drug stores, bigger supermarkets, bigger motion-picture screens. The tangible and the functional expand, while the intangible and the beautiful shrink. Left to wither is the national purpose, national educational needs, literature and theater, and our critical faculties. The national dialogue is gradually being lost in a froth of misleading self-congratulation and cliche. National needs and interests are slowly being submerged by the national preoccupation with the irrelevant. "In Need of a Consensus," Penrose Memorial Lecture to the American Philosophical Society, Philadelphia (April 20, 1961), in Proceedings of the American Philosophical Society, August 1961, p. 352. It seems to me that it is these extremists who are advocating a soft approach. Their oversimplifications and their baseless generalizations reflect the softness of those who cannot bear to face the burdens of a continuing struggle against a powerful and resourceful enemy. A truly tough approach, in my judgment, is one which accepts the challenge of communism with the courage and determination to meet it with every instrumentality of foreign policy—political and economic as well as military, and with the willingness to see the struggle through as far into the future as may be necessary. Those who seek to meet the challenge—or, in reality, to evade it—by bold adventures abroad and witch hunts at home are the real devotees of softness—the softness of seeking escape from painful realities by resort to illusory panaceas. Regarding radicals of the right, “Public Policy and Military Responsibility,” speech at the opening session of the National War College and the Industrial College of the Armed Forces, Washington, D.C., August 21, 1961, Congressional Record, vol. 107, p. 16444. The Soviet Union has indeed been our greatest menace — not so much because of what it has done, but because of the excuses it has provided us for our own failures. In Fulbright of Arkansas: The Public Positions of a Private Thinker (1963), p. 118. In these ways the war in Vietnam is poisoning and brutalizing our domestic life. Psychological incompatibility has proven to be more controlling than financial feasibility, and the Great Society has become a sick society. "The Price of Empire" speech, to the meeting of the American Bar Association in Hawaii (August 1967), in Haynes Bonner Johnson and Bernard M. Gwertzman, Fulbright: The Dissenter (1968), p. 305. During a single week of July 1967, 164 Americans were killed and 2100 were wounded in city riots in the United States. We are truly fighting a two-front war and doing badly in both. Each war feeds on the other and, although the President assures us that we have the resources to win both wars, in fact we are not winning either. To give this activity even covert support is of a piece with the hypocrisy and cynicism for which the United States is constantly denouncing the Soviet Union in the United Nations and elsewhere. This point will not be lost on the rest of the world-nor on our own consciences. Cap. X - Bay of Pigs: On March 29, 1961 Senator Fulbright gave Kennedy a memorandum opposing moral and legal grounds. We would be deliberately violating the fundamental obligations we assumed in the Act of Bogota establishing the Organization of American States. Cap. X - Bay of Pigs: On March 31, 1961 Senator Fulbright gave to Secretary of State Dean Rusk a three-page memorandum strongly against the invasio). The operation was wildly out of proportion to the threat. It would compromise our moral position in the world and make it impossible for us to protest treaty violations by the Communists. Cap. X - Bay of Pigs: On April 4, 1961 Senator Fulbright, at a meeting, verbally opposed plan. A pre-emptive war in 'defense' of freedom would surely destroy freedom, because one simply cannot engage in barbarous action without becoming a barbarian, because one cannot defend human values by calculated and unprovoked violence without doing mortal damage to the values one is trying to defend.